Today I am back with a couple of cards to celebrate the launch of one of our favourite months of the year over at Simon Says Stamp – DieCember. 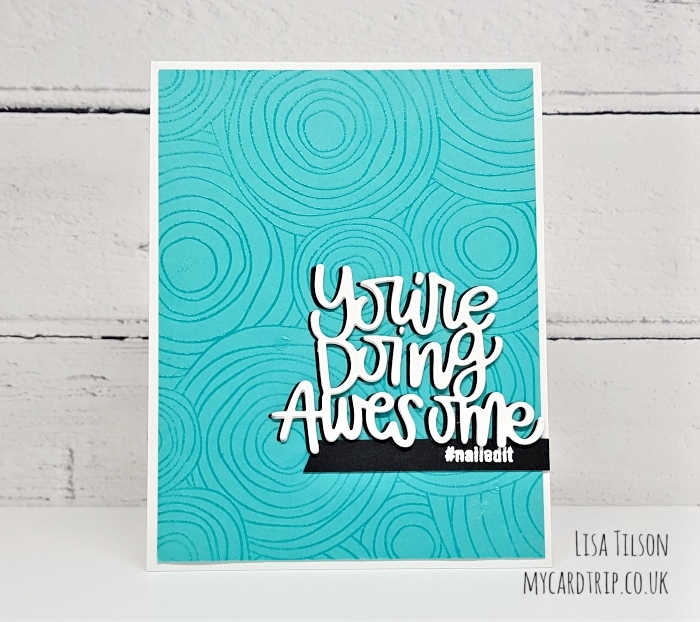 A month long celebration of dies and I was kindly sent a fabulous sentiment die to have a play with – You’re Doing Awesome. So, I have a fun, bright and happy rainbow card and I am also sharing another card which I think will make a great card for a guy. For my first card, I kept it very clean and simple – the die cut with the rainbow colours behind it really stands out against all the white. Pretty easy to make too. I took an A2 white cardstock panel and sent it and the die through the Big Shot. I then marked an area on the base card where I would need to do my rainbow colouring and used Copic markers to just blend a rainbow that sits behind the die cut. I trimmed the panel down slightly on the left and rounded the corner. A strip of black and white paper was added to the base card to add interest and the die cut panel adhered on top. To finish I stamped a sentiment from SSS/CZ Design’s “Yay” set in black ink – this ties it in well with the black and white paper. For my second card I created a stacked die cut on a heat embossed background. I took the Circle Doodle background stamp and stamped it onto some Audrey Blue cardstock with Versamark ink. I added some clear embossing powder and heat set – this gives a really nice tone on tone look and is pretty unfussy – great for a guy. I die cut 3 sentiments from white cardstock and one from black and set them to one side. The blue panel was adhered to a base panel and then I stacked the die cuts up, with the black at the bottom and the three layers of white just offset slightly – this gives the illusion of a shadow and really makes the die cut stand out. Again, I took a sentiment from SSS/CZ Design’s “Yay” and this time white heat embossed it on black cardstock and adhered it with DST under the stacked sentiment. This stamp set works wonderfully with this die cut! That finishes my two cards for you today – this die has a lovely font and is a great size too. 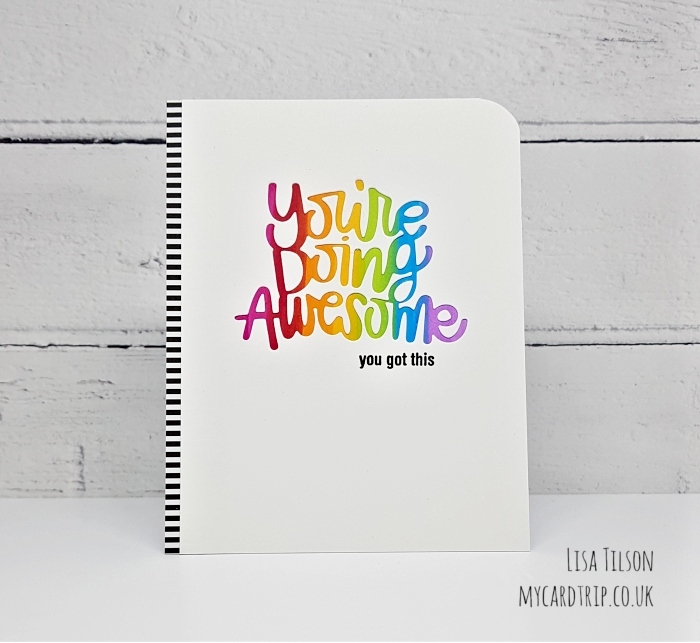 Perfect for a focal point on an A2 or square card. I am looking forward to seeing what Simon Says Stamp has for us this month – it’s sure to make me run for my purse! Have a wonderful weekend, I hope you get some time to craft. Gorgeous Lisa ! I love how the rainbow colours pop up over the white cardstock. Beautiful sentiment ! And the background of your second card, I simply Love it. Fabulous cards. Thanks for the beautiful inspiration! Oh my goodness Lisa these are awesome designs. Loving how colourful these are, they jump out the screen at you, brilliant.